Simultaneously one of the funniest and despicable World Cup moments. 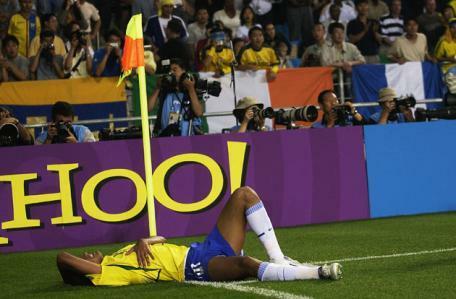 During Brazil's group match with Turkey in 2002, the Samba Boys were awarded a corner. With Rivaldo demanding the ball, Hakan Unsal petulantly kicked it towards him, hitting the Brazilian on the leg. Rivaldo saw his opportunity. He collapsed to the ground, holding his face as though he had been hurt. What made it worse was the referee fell for it, sending off Unsal for his apparent misdemeanour. Rivaldo was later fined by Fifa.